The major Apple news over the weekend was Brian Chen’s article in the New York Times, detailing some inside info from the development of the Apple Watch. The project, code-named Gizmo, was delayed a bit due to key staff jumping ship for Nest, and there is also an unannounced Power Reserve feature that will still provide the time when the battery is almost exhausted. Staying with the Apple Watch for a moment, there was also an alleged leak of the pricing structure from Italian site enjoyphoneblog.it, with prices ranging from $349 to $19,999 USD. Meanwhile, Apple have started construction on a building for their launch event next week. 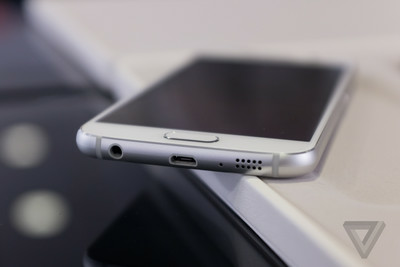 Samsung has dropped two new phones today, the Galaxy S6 and the Galaxy S6 Edge. Samsung appear to have taken some inspiration from the iPhone 6, and the absence of expandable storage and replaceable battery are a first for Samsung’s flagship. HTC also released their worst-kept secret, the One M9, along with a VR headset (developed in collaboration with Valve) and a wearable. And Huawei have released their Moto360 challenger, the rather imaginatively-named Huawei Watch. Finally, Apple have launched the iPhone World Gallery, devoting a whole section of their site to photography taken with iPhones. Some beautiful work on display, along with the apps used to create them.